How to Write an Autobiographical Novel is the author’s manifesto on the entangling of life, literature, and politics, and how the lessons learned from a life spent reading and writing fiction have changed him. He examines some of the most formative experiences of his life and the nation’s history, including his father’s death, the AIDS crisis, 9/11, the jobs that supported his writing—Tarot-reading, bookselling, cater-waiting for William F. Buckley—the writing of his first novel, Edinburgh, and the election of Donald Trump. 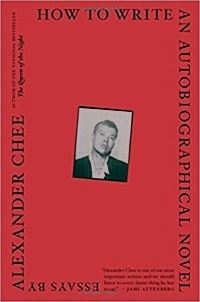 Alexander Chee won a Whiting Award for his first novel, Edinburgh, and is a recipient of the NEA Fellowship in Fiction and residencies from the MacDowell Colony, Ledig House, and Civitella Ranieri. His writing has appeared in the New York Times Book Review, Tin House, Slate, and NPR, among others, and he is a Contributing Editor at The New Republic. He lives in New York City.